Hearts Beat Loud features some good performances, but at the service of a dull story in which everyone gets everything they want without any effort or meaningful growth. 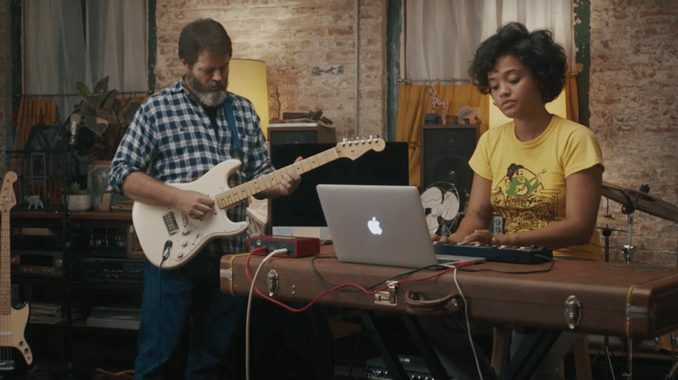 "Hearts Beat Loud" stars Nick Offerman and Kiersey Clemons as a father and daughter who share music but have different goals. It must be said as a matter of honest disclosure that I reviewed Hearts Beat Loud in order to see Nick Offerman, one of my favorite actors, starring in a dramatic role. In this regard, I was not disappointed. But in every other way Hearts Beat Loud is a dud, sagging under the weight of its subject and genre despite fantastic acting. The film tries desperately to be original, switching the traditional roles of stern father and rebellious daughter; yet, in the end, both are underwhelming, cut from the same progressive cloth, without tension or conflict, all underscored by mediocre songs in a movie claiming to “beat loud”. The central narrative twist of Hearts Beat Loud involves an inversion of familiar roles, which has been done many times before—and often more successfully (Family Ties comes to mind). Frank is hip; Sam is square. Frank likes music; Sam likes science. Frank lives in the past; Sam is looking to the future. Yet the film flounders because, apart from just a few lines, neither person challenges each other’s lifestyle or decisions. Sam might think her dad’s idea is bad, but she supports his music oppression and helps whenever she can. Frank may not understand Sam’s interests but supports her college aspirations and completely ignores her homosexual impulses. Both are “fine” with each other, but they act like roommates rather than as family. And that is one of largest obstacles of Hearts Beat Loud. Conflict, in its progressive perspective, is the result of intolerance—which is simply intolerable. There is plenty of poor behavior, but no sinning and no real stakes. Frank is supposedly broke, but he buys expensive music equipment, eats coffee shop pastries, drinks constantly, and all while living in a nice apartment in New York City. Sam doesn’t work but finds time to admire post-modern art, write on her Apple laptop, and wear vintage clothes. Everyone gets everything they want without any effort or meaningful growth. Ultimately, Hearts Beat Loud suffers from a common disease that afflicts so much art house cinema: indie slog. In an effort to go against big budget blockbusters, these filmmakers attempt to erase conflict through erasing morality. Without tension or development, scenes drag on and on. Characters talk about their favorite band, write lyrics, and sing songs that sound like every New Age-ish tune ever written. Frank even tells his daughter that “it doesn’t matter if the words don’t make sense; it’s the emotions that matter.” The genre, in short, is aggressively monotonous. Let others complain that the age is wicked; my complaint is that it is wretched; for it lacks passion. Men’s thoughts are thin and flimsy like lace, they are themselves pitiable like the lacemakers. The thoughts of their hearts are too paltry to be sinful. … This is the reason my soul always turns back to the Old Testament and to Shakespeare. I feel that those who speak there are at least human beings: they hate, they love, they murder their enemies, and curse their descendants throughout all generations. They sinned! Then again, Nick Offerman was amazing, so there is that.